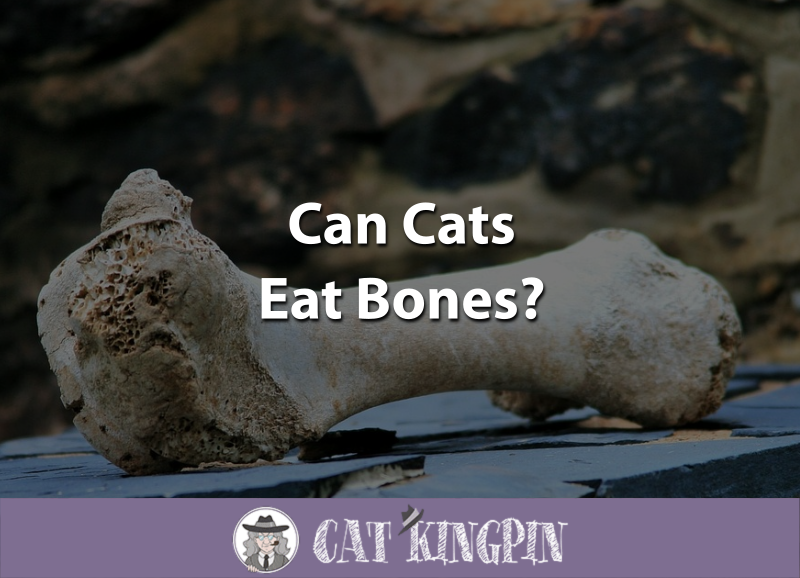 » Can Cats Eat Bones? While it’s much more common with dogs, sometimes cat owners will think about giving their cat a bone or two to munch on. Cats are almost always enthusiastic about bones, especially bones that come from meat and fish, but can cats eat bones? While chewing on and eating bones can have health benefits, the answer isn’t as simple as “yes” or “no.” Bones can pose a serious risk to your cat’s health if you aren’t careful. It’s important to learn which types of bones are safe for cats, and in which form to avoid potentially deadly consequences. Can Cats Eat Dog Bones? Can Cats Eat Fish Bones? In the wild, cats aren’t picky about which part of the animal they consume. While our domesticated feline friends may turn their noses up at a variety of different foods, feral cats that live outdoors know that pickiness can be their downfall. When a wild cat hunts and kills prey for food they are likely to eat it in its entirety, bones and all. Bones do wonders for feline dental health and the marrow provides a nice nutritional boost for a cat who doesn’t know where their next meal will come from. Pet cats are a different story. Most cat owners feed their feline friends a variety of commercial cat food, which, as long as it is relatively high in quality, should provide their cat with all the nutrition they need. Moreover, bones can pose a serious choking hazard for cats and can even wreak havoc on their digestive system, especially if the bones are cooked. While raw bones are pliable and less apt to split, bones become brittle with cooking and can break off into extremely sharp shards. While allowing your cat to munch on a raw bone once a while is unlikely to do them any harm, you should never allow your cat to eat cooked bones. If you do give your kitty a raw bone, you should supervise them to make sure they don’t choke or bite off any large pieces. Although your cat’s larger relatives have the jaw power to pulverize bone which makes them safe for eating, our little kitties simply don’t. Chicken bones are chock full of vitamins and minerals that are crucial to a healthy feline diet, such as calcium and magnesium. Giving our beloved kitties a taste of meat and cleaning their teeth in the process may seem like a very good idea, but the reality is that the risks may outweigh the benefits. In a nutshell, cats should never be given cooked chicken bones as they may splinter. Raw chicken bones are usually safe, but you are still putting your cat at risk for a variety of foodborne bacteria, such as salmonella. If you want to offer your cat a raw chicken bone be sure to freeze the bone beforehand to kill off the majority of bacteria, check the bone carefully for any splinters, holes, or small pieces, and then supervise them while they eat it. There are a ton of doggy bones on the market. Dogs love to chew, and in the dog aisle of the pet store you can find everything from real beef bones to plastic-based chews. These types of bones are specifically made for dogs. Dogs and cats have very different jaw strength and teeth, so what may be perfect for a pup might be disastrous to your cat. It’s also unlikely that your cat will be interested in bones made for dogs. Even if they are made of real bone, they are likely too large for your cat to enjoy. Fish bones, even when raw, aren’t worth the risk. Giving your cat a piece of fish is a nice idea, but make sure to remove the bone first. Fish bones are small, pliable, sharp, and easy to choke on. Some fish, like sardines, have such small bones that cats can eat them without much worry. Cats are usually pretty good at avoiding bones when eating whole fish, but why risk it? If your cat loves fish, offer them a piece that has already been cleaned and deboned. Not only does this eliminate the risk of choking, but you also can feed it to your cat without having to supervise them! It is never a good idea to give a kitten a bone, no matter what type of bone it is. While your kitten may show a lot of interest in bones, kittens have small mouths, small tracheas, and tiny teeth: none of which are particularly well-suited to eating bones. Perhaps more importantly, kittens are growing like weeds and should only be consuming healthy calories with a ton of nutritional value. It’s best to feed your kitten a strict diet of a high-quality kitten food, such as Merrick Kitten Food, and plain water to drink. Some owners opt to allow their kittens to eat organic, raw bones, like the kitten in this video. However, this is still risky and, if you do attempt it, you should watch your kitten very carefully! Bones do actually have a good deal of nutritional value, which is part of why our cat’s wild ancestors would readily eat them rather than leave them behind. But for modern day house cats the risks outweigh the benefits. Cooked bones are absolutely forbidden. You should never allow your cat to eat any kind of cooked bone, no matter which animal it comes from. Raw bones, while safer, can still splinter, host all sort of unpleasant bacteria, and pose a choking hazard. As long as you are feeding your cat a healthy diet, you shouldn’t need to worry about giving them a boney nutritional boost. If your cat is really interested in eating a bone, there are plenty of safer alternatives. If you’re interested in giving your cat something bone-like to chew on, a great option is a bone-shaped cat treat, such as N-Bone Cat Chews. These little bones, which are actually not made of bone at all and are completely digestible. Plus, they’ll help remove plaque and tarter while giving your cat something satisfying to munch on. On the other hand, if it’s the nutritional benefits of bone that you’re after, you can try offering your cat a little bit of bone meal as a nutritional supplement. This powder, which is made up of steamed and dehydrated animal bones, offers plenty of calcium and other vitamins without the risk. So, can cats eat bones? While cats technically can eat bones, the risks far outweigh the benefits. Cooked bones can actually kill your cat if you aren’t careful. They can splinter and cause internal injury and your can can easily choke on them. While raw bones pose less of a hazard because they are more pliable and less likely to shatter, they still can contain bacteria which can make your cat sick. If you want to give your cat something satisfying to chew on, try N-Bone Cat Chews, which offer the same dental benefits as real bone without all the risk or else bone meal, which is the safest way your cat can eat bones. Does your cat love bones? How do you satisfy their craving without compromising their health? Have you found the best “bone alternative” out there? We want to hear all about it, so let us know in the comments!